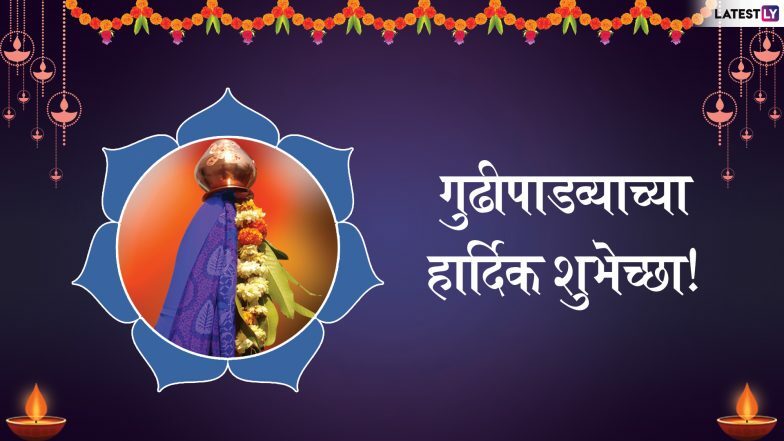 April 6 is an important day for all people of the Maharashtrian community as it marks the festival of Gudi Padwa 2019. It is the Maharashtrian New Year and time for festivities again as the Hindu calendar month of Chaitra begins tomorrow. 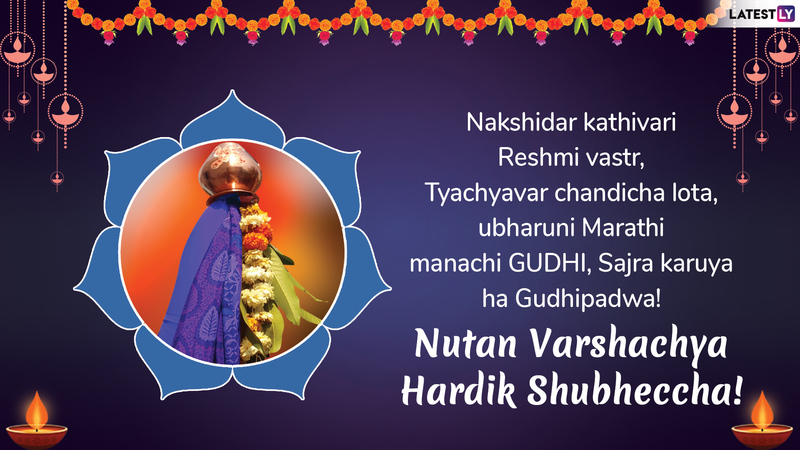 Gudi Padwa also marks the beginning of Chaitra Navratri the nine-day festival worshipping Goddess Durga. The festive time is also a time when people exchange good wishes and greetings with their friends and family. 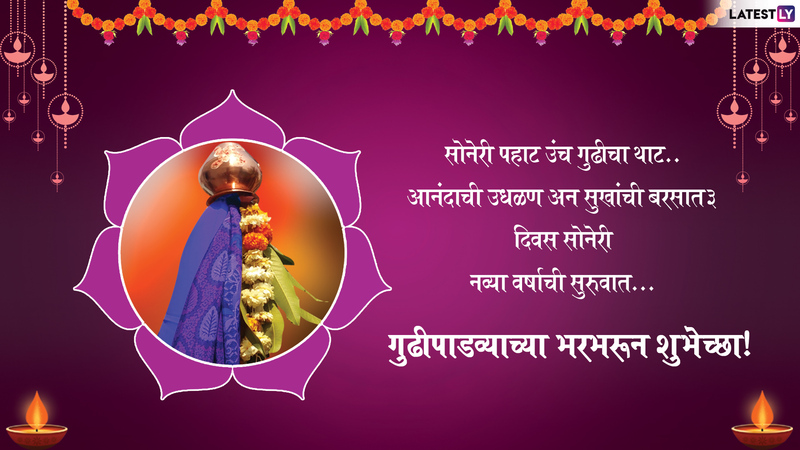 Essentially celebrated by the Marathi speaking community, most people search for Gudi Padwa Marathi messages. 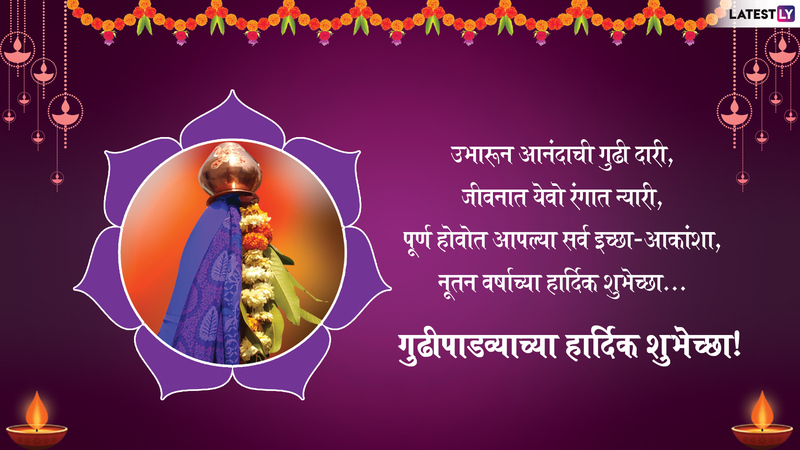 If you are looking for Gudi Padwa wishes and quotes in Marathi let us help you out. 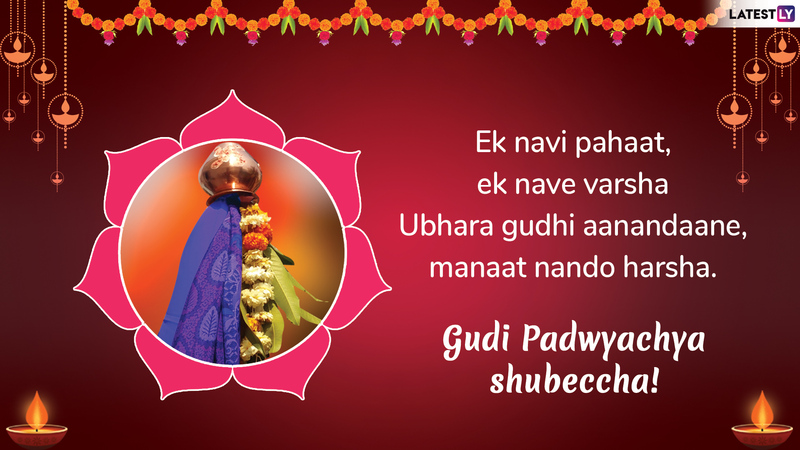 We give you a collection of Gudi Padwa wishes, WhatsApp Stickers, SMS, and GIFs that you can share as Facebook Status or just send across as Gudi Padwa greetings. Gudi Padwa Shobha Yatra 2019: All About The Traditional Procession Organised on the Maharashtrian New Year, View Pics! Gudi Padwa is a festival that marks the arrival of spring and also a beginning of a new year. So it is celebrated with equal enthusiasm like any other festival of the Hindus. Along with Gudi Padwa other festivals like Cheti Chand, Ugadi, Chaitra Sukladi are also celebrated throughout the country. People prepare special delicacies, dress their best and be a part of the traditional Shobha Yatra. People eagerly exchange Gudi Padwa wishes with the friends, family or share them on Facebook. Since it is a new year beginning, all of them wish for success and prosperity for each other. 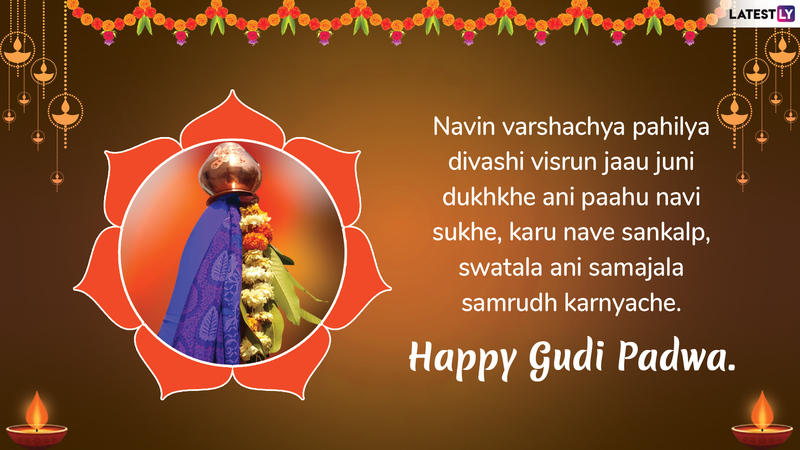 We give you a collection of Gudi Padwa messages and wishes in Marathi. Gudi Padwa Images & Ugadi HD Wallpapers for Free Download Online: Wish Happy Marathi New Year 2019 With GIF Greetings & WhatsApp Sticker Messages. Message reads: उभारून आनंदाची गुढी दारी, जीवनात येवो रंगात न्यारी, पूर्ण होवोत आपल्या सर्व इच्छा-आकांशा, नूतन वर्षाच्या हार्दिक शुभेच्छा… गुडीपाडव्याच्या हार्दिक शुभेच्छा! Message reads: Navin varshachya pahilya divashi visrun jaau juni dukhkhe ani paahu navi sukhe, karu nave sankalp, swatala ani samajala samrudh karnyache. Happy Gudi Padwa. Message reads: Ek navi pahaat, ek nave varsha Ubhara gudhi aanandaane, manaat nando harsha. Gudi Padwyachya shubeccha! Message reads: Nakshidar kathivari Reshmi vastr, Tyachyavar chandicha lota, ubharuni Marathi manachi GUDHI, Sajra karuya ha Gudhipadwa! Nutan Varshachya Hardik Shubheccha! दिवस सोनेरी नव्या वर्षाची सुरुवात…गुढीपाडव्याच्या भरभरून शुभेच्छा! Otherwise caught up in a daily routine, a festival is a time which sees everyone coming together and spending time together. Thanks to social media like Facebook and WhatsApp it is easy to send messages with a click of the button. You can also send WhatsApp sticker greetings for Gudi Padwa. Download Gudi Padwa special sticker pack from Play Store and send Gudi Padwa stickers to send your greetings. We hope that the above greetings and messages help to send you Gudi Padwa wishes. So, dress up, have an indulgent family day and of course spread the cheer for the New Year. We wish you all a very Happy Gudi Padwa 2019!